While I will share more details about this interesting man, it would appear, or so I speculate, that it was his kidneys that gave way. He had been on dialysis for some years now. Dr Zachariah had an impact on so many of us. Some of what he taught us then 11 years old has stuck like glue for the rest of our lives. I even today live by the value system that he and some of the others inculcated in us. I am glad he touched my life and owe him a big thanks. May his soul rest in peace. He was a good man, nay a wonderful man!! I am sending below the message received from my friend in Ohio. Very sad indeed. Very sorry to inform you that Dr. Mathew Z passed away 25th early morning 12.30 their time. All the children wife Saro and his brother Dr.Alex was also there with him. May his soul rest in peace. Here is an obit for Dr Mathew Zachariah that appeared The Calgary Herald. Mathew Zachariah May 24, 1935-October 25, 2016 Mathew Zachariah passed away on October 25, 2016. He was born in Tiruvalla, Kerala, India in 1935. He spent part of his childhood in Miri, Borneo where his father was an accountant with an oil company, returning to India with his mother in the early 1940’s when a Japanese invasion was imminent. He had and older and younger brother. His father suffered much during the war years in Borneo and died in 1946 on his return to India. In 1942, he was informally adopted by his mother’s older sister and husband, a childless couple, and raised as their son. In the early 1960s he moved to the U.S. as a Fulbright scholar to advance his post-secondary education, and in 1966 accepted the position of assistant professor with the Faculty of Education at the University of Calgary. He became an associate professor in 1969 and full professor in 1973. 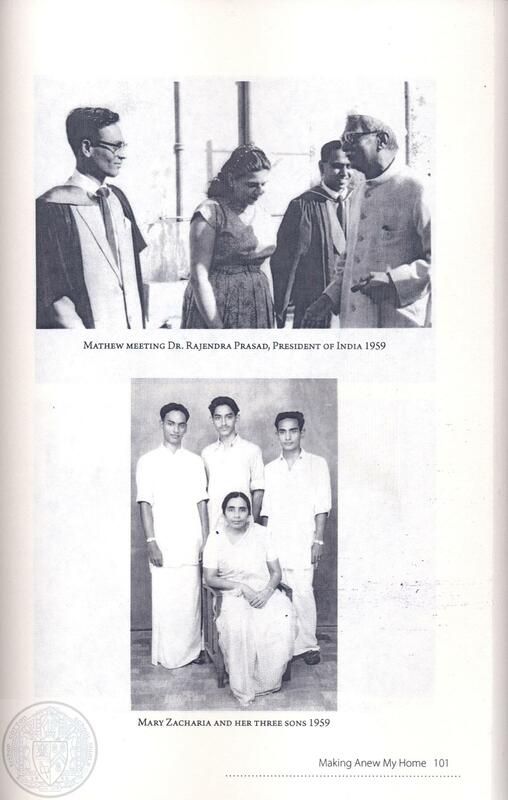 Dr. Zachariah holds several degrees, including a BA in economics from University of Madras (1956), B.Ed from University of Delhi (1960), MS in Education, English and Social Sciences from State University of New York (New Paltz, 1962) and a PhD in Social Sciences and Education from University of Colorado at Boulder (1965). A comparative sociologist of education, he made significant contributions to academic services at University of Calgary as department head and associate dean in the Faculty of Education. He retired from the U of C in 2000 after more than three decades of service and was honoured as an Emeritus Professor of Education. He continued his community service activities, despite failing health. He is the recipient of numerous awards and honours, including a U of C Students’ Union Award for excellence in undergraduate teaching in 1985 and in 1999, a national award from the Canadian Committee of Students in Education for mentoring masters and doctoral students. He received the Alberta Human Rights Award in 1989, as well as the Internationalization Lifetime Achievement Award by the U of C in 2002. In 2004, Dr. Zachariah was named one of 114 leaders in the university community recognized for outstanding achievement. After his retirement, he was distinguished visiting professor at the University of Pittsburgh and Menno Simons College in Winnipeg. He was a prolific author and published many books, articles and essays to his credit. He has also published short stories and poems. The leitmotif of his life was to be a promote justice and fairness to people denied their dignity and were oppressed by the dominant economic and cultural institutions. He was the first Canadian to receive the Honourary Fellow designation from the Comparative and International Education Society, USA (CIES). This honour recognized the contribution Dr. Zachariah has made to the development of comparative and international education throughout his teaching career, as well as the impact he has had on various academic and professional organizations. He was an Anglican all his life and became more active in the life of his church after retirement. This entry was posted in News, Obituary, Post and tagged Condolences, Mathew Zachariah, News, Obituary on October 27, 2016 by admin. Mr. Zachariah, as we knew him at BCS, taught there during the late 1950’s and through the 60’s. Dr. Zachariah shines out, in the brilliant work he has done in Canada where he migrated to from India. We OCs join in thanking him for the education he imparted to us, and are so proud of sharing a common association – BCS Simla. Mathew Zachariah, Ph.D. retired from the University of Calgary in 2000 after more than three decades of service and is now an emeritus professor of education. His academic specialty was comparative sociology of education. He has taught, researched and published extensively in the areas of race relations, multicultural education and international development. His professional and voluntary service activities have also been in these three areas. He was a member of the Board of Directors of the Canadian Race Relations Foundations (2003-2006). He co-edited Canadian Multiculturalism: Dreams, Expectations, Realities published in 2004. The most recent of his 15 career awards was in 2005: The Alberta Centennial Gold Medal for his contributions in the area of human rights, multiculturalism and diversity. Dr. Zachariah continues to be active in promoting respectful dialogue between communities within Canada and internationally. Dr. Zachariah’s avocation is writing essays, articles, poetry and short stories. A few of his general interest essays, articles, poems and short stories have been published in newspapers and magazines. Examples: One of his short stories was awarded second prize and was published in Calgary Herald in 1986. His long poem “My Place? My Home?” was published in Sense of Place: A Catalogue of Essays (Nickle Arts Museum, 2005) pp. 29-31. Dr. Zachariah is primarily a comparative sociologist of education. He has been internationalizing the University of Calgary since its inception in 1966 through his teaching, research, writing, and volunteer work. He has been the Academic Co-ordinator of Development Education (International Centre), Associate Dean, Faculty of Education, Head of the Department of Educational Foundations, and Development Studies Co-ordinator, Faculty of General Studies. He has also served on the University Senate and on various university committees, and has supervised numerous graduate students in the field of international studies. Dr. Zachariah has created many courses in his area of expertise that have influenced his colleagues in Calgary and worldwide. He is renowned internationally for his work in development education and international/comparative education. Over the years he has sensitized colleagues, students and members of the community about important “North-South” issues. He has received 32 local, provincial, national and international academic and community research grants, 95 percent of which have led to at least one publication. He has received 11 honours during his tenure at the University of Calgary, including two terms as a Killam Resident Fellow, and two terms as a Fellow of the Institute for Humanities. The Comparative and International Education Society, based in the USA, named him an Honorary Fellow, a rare honour, this past March. He also has had a long association with the Shastri Indo-Canadian Institute as Chair of the local Shastri Committee, Member of the Board, and Course Director for the Summer Programme in India. Dr. Zachariah has been a visiting professor or fellow at the University of Pittsburgh, the Centre for Development Education in Kerala, India, the University of Delhi, the Regional Institute for Higher Education in Singapore, the University of Alberta, the Ontario Institute for Studies in Education, the University of British Columbia, and the International Institute for Education Planning in Paris, and other institutions. He is currently a member of the Executive Committee of the Canadian Commission for UNESCO. Recently, Dr. Zachariah returned from Manitoba, where he was the Paul and Ester Esau Distinguished Visiting Professor at Menno Simons College (affiliated with the University of Winnipeg). Dr. Zachariah has been an ardent ambassador for the University of Calgary throughout his career. Although he officially retired in 1999, he continues to be actively involved in campus life as both Professor Emeritus and Faculty Professor in the Faculty of Education. This entry was posted in Post, Spot Light and tagged BCS Teacher, Canada, Mathew Zachariah, Spot Light on August 6, 2009 by admin.